While the gymnasium is austere in detailing and simple in interior function, it provides significant urban mass and anchors the southern end of Library Lane at Breckinridge Street. Despite seemingly good intentions, destruction of the structure will profoundly degrade the urban environment around it. The building’s simplicity make it an obvious candidate for adaptive reuse. Rick Barney, a University spokesman, says the gym may not be torn down until the Spring or later, but the building is already in imminent danger as half of the 30-day demolition moratorium for structures older than 60 years has expired. Barney says Spalding believes adding green space along Library Lane, an alley serving as a pedestrian spine connecting the University and the Main Branch Library, will improve the area. No plan has been finalized for the green space plan, but Mike Ernst, Spalding’s Vice President and Chief Financial Officer, says the school is currently working with an architect and imagines the gym parcel will contain a gazebo-type structure in a park-like setting. Ernst says the University’s master plan calls for adding more green space in the future to create a more campus-like feel. He says the next phase currently calls for converting parking space on the south side of Breckinridge Street into a park and demolishing two more historic structures also south of Breckinridge. In June of last year, Presentation Academy held a “farewell party” for the old gymnasium that had been part of its campus for 71 years. The structure had served as Presentation’s gym, theater, and was used for liturgies and gatherings up until last year and many artifacts from the building were auctioned off. Presentation’s Sister Chris Beckett said at the time that bricks would be salvaged and the gym’s old wooden floor would be used for fundraising purposes. The property is now owned by Spalding after it assumed ownership of Presentation in 1995. Presentation began operating independently again in 2005 but the gym remained with Spalding. Spalding has had a contentious relationship with preservation in the past. Richard Jett, Historic Preservation Officer for Louisville Metro Planning & Design Services, says that because the structure sits outside the Old Louisville historic preservation district, there’s little that can be done to save the building without Spalding’s support. He lauds the University’s and Presentation’s commitment to their urban location when other schools have left for the suburbs but regrets the low priority of preservation apparent in Spalding’s master plan. Jett remembers two recent Spalding demolitions that are now grassy lots. An Italianate structure was torn down on Fourth Street between York and Breckinridge leaving only a set of stone stairs to mark the place of the old building. More significantly, an 1840s-era Greek-revival townhouse was destroyed directly across the street from the old gym and was believed by Jett to be one of the three oldest structures in the Downtown area along with a townhouse on Fifth Street (across from the Cathedral of the Assumption) and another recently restored townhouse on Second Street (next to the Episcopal Cathedral). At the time, some were suggesting the old house be converted into a coffee shop or similar use. Marianne Zickuhr, Executive Director of Preservation Louisville, also laments the destruction of the old gym. She says while Spalding’s plan may bring more green space to SoBro, the idea is far from being “green.” Besides advocating for preservation of Louisville’s culture and history, Zickuhr says it’s also the sustainable thing to do as there has been so much time and energy invested in building the structure. To tear down a sturdy building is to lose that investment. She also points to the economic benefits a possible renovation could bring to the community and the benefits of having historic structures on a college campus. Tucked behind a more modern facade is one example of preservation already on Spalding’s campus. The University’s Administration Building surrounds the 851 Mansion, built in 1871 and designed by noted architect Henry Whitestone. The structure has been completely restored and is listed on National Register of Historic Places and is a Kentucky landmark. 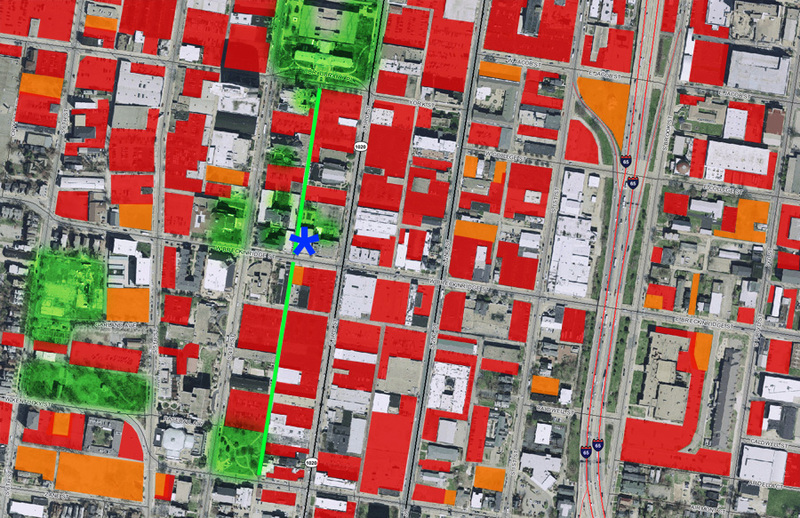 Patrick Piuma, Director of the Urban Design Studio, has spent a significant amount of time studying SoBro and working on the SoBro Neighborhood Plan. He says “the last thing SoBro needs is more empty space” and also regrets plans to demolish a structure that could be reused. Piuma said Library Lane is a defining feature of SoBro and the neighborhood plan calls for strengthening the pedestrian axis. He is quick to note, however, that Library Lane, like any public space, could be great only if properly designed and activated with uses that will draw people and encourage lingering. Library Lane could serve as a pedestrian artery connecting the Main Branch Library at York Street with Memorial Park at Kentucky Street and serve as a defining element of University’s campus. Spalding’s campus is inherently urban in nature, a fact that should be celebrated, and as a result requires a more nuanced understanding of public space. A traditional building in the park approach such as at U of L simply won’t work. The seeds of great green spaces already exist at Spalding and throughout the Library Lane corridor. The defining architectural characteristic of outdoor space on the block is the cloistered courtyard feel (see diagram below). There exists a procession of courtyard spaces each offering a distinct and intimate experience. Photos of many of the courtyards after the click. The gym in question helps to define two of the courtyards surrounding Spalding’s library and also serves to mark the entrance of Library Lane on Breckinridge Street. Inside, the gym is one large room. A gymnasium with a wooden stage at one end and not even enough room for bleachers. That certainly sounds like it’s no longer an ideal gym, and I agree. However, with a nearly 15,000 square foot area and tall ceiling heights that could accommodate a lofted second floor, the building is still big enough to be useful. There are plenty of potential uses for the old gym ranging from classrooms, to a lecture hall, to a gathering space. One option I find intriguing is the potential to bring a third library to Library Lane by converting the structure into a modern library facility for Presentation Academy. A second floor could be added to the gym to accommodate additional space and portions of the northeast corner could be converted to glass walls to blend indoor study space with outdoor courtyard space. This manipulation of the northern facade will be key in reusing the structure. Like most older buildings, the gym puts its best face to the street. The back facade is plain and some might say downright ugly. That’s where the potential to blend the old and the new to enhance both the building and the outdoor spaces reaches its full potential. It’s clear the opportunities for reuse exist even while funds or a clear vision might not currently be in place. The only thing required is saving the building from the wrecking ball. It’s understandable and laudable that Spalding wants to improve its urban campus, but to destroy the urban nature that makes it unique makes no sense. The old gym should be used creatively to strengthen the character of campus courtyards linked by a pedestrian alley instead of simply being removed for more open space in a neighborhood with too much flat open land. 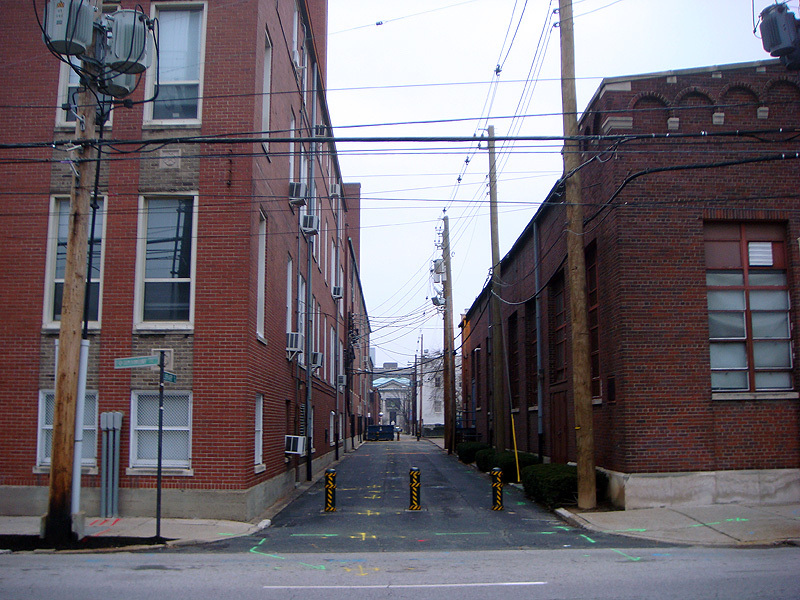 Before the building is destroyed, a collaborative study (perhaps involving Spalding, the neighborhood, Metro Louisville, and the Free Public Library) should be undertaken to determine the full potential of Library Lane. We shouldn’t leave the burden only to Spalding as the feature stretches beyond its boundaries and affects more than its students. Activating the corridor will also require commercial investment outside the scope of Spalding University. Existing park features such as Ben Washer Park and Memorial Park (designed, in part, by Spalding students) should be strengthened and can serve as well-defined park space anchoring the southern edge of SoBro. To the north, the Main Branch Library could serve as a green node and in between, pockets of green courtyards sheltered from wind and noise could accentuate the urban form. But first, the old gym must not be demolished. spalding, this demolition will not be an improvement but a loss to the community – one that can’t be recovered! with just a little brainstorming effort this piece already raises some interesting ideas that could feed a master-planning process – one which leverages the legacy buildings spalding has and finds new opportunities for their unique urban situation. i hope they’ll consider pursuing a rigorous master-plan, sensitive to their context and to the historic fabric they occupy. if there is a public comment process in place regarding this demolition, please share contact information. i’m ready to write my protest. Me, too. You know, I got a couple of books dealing with the history of Louisville for Christmas. I looked through the images of what we have lost and almost wept. I kept saying to myself, “What impulses could imagine these places, these buildings worthy of destruction. What failure of imagination was at work then.” That same failure of imagination continues to kill. Even if they feel that they MUST tear it down for green space, why not save the facade? It could make a nice entrance to the area, it sounds like it’s the most architecturally important part of the building, and it would still be in place to be part of some future building at that site. Does Frank Faris work for Spalding? Spalding has been tearing down important buildings on their campus for several years now, and nobody can stop them. I do not know why they dislike historic buildings. Maybe they see them as liability, just like all of the other individuals and corporations that raise buildings like this one everyday. It’s a shame, a real shame that they would raise this building instead of selling it so someone else could save it. Not having been in it, I’m not sure, but your description sounds like it would be a great conversion to a small theater. Louisville has a handful of community theater groups without a permanent home, ask Bill Waylan, the theater at Henry Clay quickly found tenants. It’s be much better placement (edge of downtown) then the Thrust (I think that’s what it’s called) at UofL where a lot of community theaters work while they are getting started. And it’s not like Spaulding had an economic incentive to tear it down, if they could lease it to a theater group, they would save themselves the costs to demo and build a park. And it seems like that would be a compatible use with a University campus. Just my two cents. Though I like Brandon’s library idea better. Great coverage of this issue and other land use issues in Sobro. Unfortunatetly, Spalding continues to essentially land bank without a appropriate or visionary plan for their facilities. According to Ernst, Spalding’s master plan calls for more park space to create more of “campus” feel. I find this misguided considering that the school is in an urban setting. It is unfortunately a rural or suburban ethos without respect for its context. It would be good to see greater pressure applied to Spalding to do the right thing, but I worry that there isn’t enough inertia in Sobro to fight this. Thanks for the coverage on this issue, Branden. For what it’s worth, I emailed the two Spalding associates you mentioned at the beginning of the article. I ride past this building almost daily. It’s in a tough place, but I think green space would be awful. Here’s a thought. Put in a ton of skylights and turn it into an indoor garden with a cafe, performance space, and plenty of room for studying. Having briefly been a student at Spalding, I know that there isn’t a good indoor option for students to gather. Do or should property owners have rights? The question is not one of property rights. It’s one of context. If Spalding demolishes that building, it will be the result of shortsighted thinking. Planner Guy is right. This is an urban site, and Spalding is an urban institution. Buildings like this have a wealth of potential uses, many of which have been discussed here. Let’s hope Spalding realizes what an asset it has on its hand. Just another example of Spalding’s disinterest in the city and historical preservation. After coming to the Old Louisville Neighborhood Council for support in building their student center, they callously tore down two Victorian mansions because the “suddenly” discovered they needed parking for said student center. This over the vehement objections of the Old Louisville neighborhood. The lack of Spalding’s vision for an old building speaks volume about the quality of their education of their students. A gymnasium has a multitude of uses: theatre, community meeting place, neighborhood gym, church, etc. Individuals and neighborhood groups should speak out now to save this building, and not just speak out on this blog. And Old Louisville organizations should lobby to get the historic district extended to include Spalding’s campus. Perhaps NOLA should be the guiding light for “green space” in the Spalding area, courtyards or interior space. Based on the posted pictures of interior open space, Spalding seems to be moving in that direction. With absolutely no knowledge of Spaldings or Presentations needs and no technical knowledge of how the building could be preserved, the idea of at least preserving the facade as an entrance to the proposed new green space and “library lane” seems like a good idea. Maybe a small cafe could rent part of the space and the rest could be devoted to computer workstations and comfy chairs? I am hoping that Spalding will not go through with this proposed demolition. We certainly do not need more “green space” in this corridor. That is a great building, that, once inside, is much larger than it appears. The new Presentation building just adjacent to it is such an asset for this part of the downtown, it would be such a shame to add a blemish to the same area where that fine new building is located. we do projects that replace HVAC, reroof, and renovate major interior development all the time! very seldom does it mean going back to the ‘shell’ because there are almost always hidden gems of the original building that have been concealed – or just not paid any attention. the assumption that the inside will need to be ‘completely torn out and restart’ *may* be true, but hardly ever is. a sensitive architect will weigh what should be kept to maintain the character of the place against the cost of keeping it. a full gut-and-redo more often erases many of the reasons you’d save the building. cost is often the argument against saving and renovating, but we’ve also shown again and again that renovation can be as much as 1/2 the cost of new construction, sq ft for sq ft, and the result when you have a historic structure as a base can be so much more special than anything we’d be likely to build new. Since we’re on this subject… Archintent – is that gorgeous, dangerous building at the corner of Main and 8th beyond salvation? Does it hover in that netherworld between demolition and resurrection? Another aspect of cost to consider is Keeping Louisville Weird. If the building it torn down and replaced with a new structure, a very large portion of that cost will go directly to the out of state or foreign companies that manufactures the materials — bricks, lumber, windows, hvac, etc. But if the structure is preserved and adapted for reuse, a high portion of the costs will go toward labor and local craftsmanship. It may cost the same or even a little more, but the investment in Louisville’s economy will likely be a significant multiple. And as others have said, an investment in preserving our past is an investment in our future. by 8th & main, i’m assuming you’re talking about the fort nelson building, ken. (northwest corner of intersection.) it’s a hard case. except for some stabilization and some good intentions back in the mid-90s, it’s been sitting there since i moved to town. The razing of this structure would be a terrible mistake. 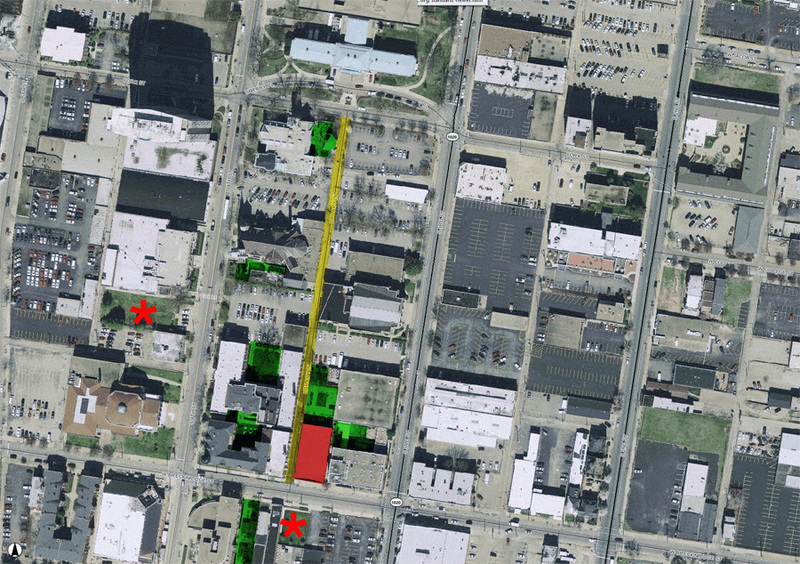 Green spaces in core urban areas can be tricky and Sobro already has too much open space. The structure would make a nice landmark entrance into Library Ln. and should be converted to benefit the school and the neighborhood. I’d be glad to… I’ll give you a call on Wednesday, if that’s okay…? @JC, they aren't planning to build a new structure, but to put in some green space.